This is the first time I’m doing a review for RoleCos, however I have been their customer for years and I thought I should share my experience with you. First of all, Wig-supplier is a cosplay store that sells quality costumes and wigs for very affordable price. I have been purchasing their items for quite some time, together with my friends and I’m happy to know that some of you started buying from them as well thanks to my recommendations. WIg-supplier has a very nice customer service and they are very patient and kind. I was so happy with the way they treated me and how they assisted me during the whole delivery process! They would question if my wig has arrived and if everything was okay, which made me quite happy since stores usually don’t bother with knowing if the customers received the items or if they are pleased with what they got. I received a long brown wig from them, which you can find here. 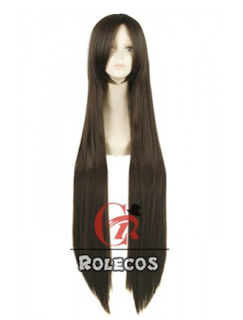 Features: This long hair is a light brown straight wig, you can wear it in your cosplay praty and daily life, too. The wig was shipped super quick and it arrived to my country within two weeks – this is perfect if you need a wig to arrive in a short time! Most of my wigs take up to five weeks to arrive. Upon receiving it, I noticed that the wig is pretty thick and heavy, so you can really expect the net and your hair to be completely covered. The wig is not light brown tho, it’s just as on the picsture and it’s quite dark. If you’re looking for a lighter color, you can check their other long brown wigs out! 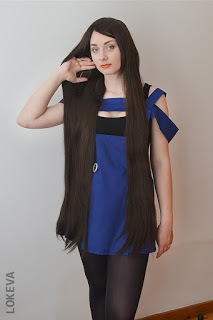 To try this wig on, I got in Windi’s Lisa Lisa cosplay, as I had no other costume I could wear with this wig yet. 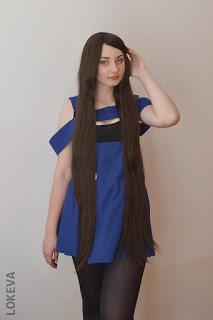 As you can see, this wig is very long! It is even longer than the skirt I am wearing. 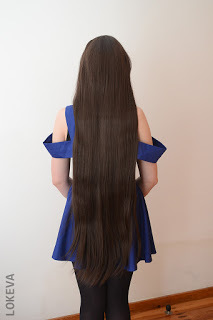 The wig is pretty thick, which can cause you some trouble because of the tangling, but I tried this method recently and it prevented my wigs from tangling as much! Despite being a very heavy wig, it didn’t feel heavy on my head. It actually felt pretty light. 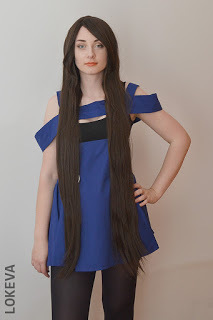 It was a little difficult for me to wear a wig this long, but I am going to style it, so 100cm is not a problem for me, but if you really need a wig this long, you should consider getting yourself a detangling spray so you can keep the wig in place. Detangling sprays cost about 5-8$ and they are a huge help! I think that this wig doesn’t look shiny unless it’s under a strong light, like sunlight. The wig has a natural shine to it and the color seems pretty natural as well. The fact that the wig doesn’t lose hair is a huge plus, since it proves that the wig has quality. I’m not so sure if the price corresponds to the quality since it seemed quite cheap for something this good! The wig is also heat resistant, so the price is amazing for what you get! Overall, this wig is 20/10. It’s very long and heat resistant. The wig is thick and has natural color and shine to it. The price is quite good for what you get and I really recommend you to purchase wigs from their store! Expect a video review by the end of this week! I’m currently editing the video! 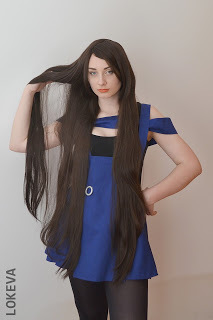 This entry was posted in Buy Cosplay Wigs, Fashion Wigs, Human Hair Wigs, L-email Wig review, Wig Maintenance and Care, Wigs, Wigs Hairstyle Selections and tagged anime wigs, black color wig, cheap cosplay wigs, cosplay wigs, L-email wig review, L-email wigs, long wigs, straight fashion wigs, straight wigs.